Living on an island, we know only too well the impact of winter storms on our lives but what impact do these storms have on birds, particularly sea-going birds? 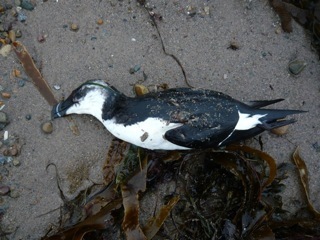 In February there is the annual systematic count of dead shore birds called the “Beached Bird Survey”. It is a European wide survey giving an insight into the impact of winter storms on sea going birds. Here on Arran around twenty volunteers from the Arran Natural History Society walked the shores counting and identifying dead birds around the weekend of 21/22 February. found. The next two largest groups were Guillemot at eight percent and gulls at seven percent. These birds seemed to have died of exhaustion or starvation as a result of days of gale-force winds, which made it impossible for them to fish. In 2013 nearly four thousand dead birds were washed up on UK coastlines. In France a total of 21,341 dead birds were found in western France by 500 volunteers working over three weekends. It was similar from Portugal to Shetland and 2013 may have been the biggest North Atlantic seabird mortality in living memory. By contrast this year, the figure from Arran was not 281 as it had been in 2013 but four, all gulls. Why the marked difference? It may have been that last winter there were prolonged strong gales and high seas in the birds' feeding areas. Hence numbers of birds died through being unable to forage in the sea. This year the gales may have been fewer and shorter. The birds know how to find shelter in bays and around islands. The seabirds can last a few days in stormy weather no problem. It's when it goes on and on, as it did last winter, that they have problems as they did last winter but not this winter.